Brian and Janice fell in love after a chance encounter at Mill Creek Winery. As a good friend of winery owner Bill Kreck, Brian visited frequently. One day he saw a new face on the summer bottling line. Brian quickly asked Janice if she would go on a date in his little Porsche and they never looked back. 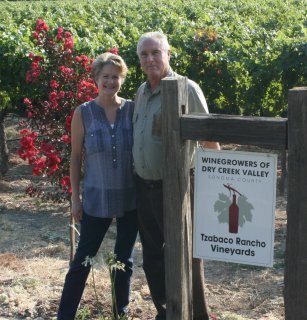 Celebrating their 36th anniversary this year, they remain committed to each other and their dreams for the family ranch and vineyards. Brian Schmidt was born in Healdsburg and grew up on the family ranch with his sisters, Diane and Kay. Helping farm and pick prunes, showing sheep in the annual Healdsburg Future Farmers Fair and helping to transition the ranch to vineyards gave Brian a hands on appreciation for the family farm. As the fifth generation living and growing up on this property, he felt his job was to help preserve the property for the next generation as his parents had done. He continues to farm the property utilizing the techniques he learned at Cal Poly, the wisdom he gained from his father and grandfather, blended with the technological improvements of today. As a founding member of WineGrowers of the Dry Creek Valley, Brian is focused on promoting the region’s award winning grapes. You’ll often see him during the annual Passport event as he facilitates the positive experience that thousands of wine lovers enjoy each April! Brian’s wife, Janice Osborne Schmidt had a keen appreciation for animals and country life from childhood. Whether focused on horses or goats, zucchini or pumpkins, she loved the outdoors and growing things. While growing up in Santa Rosa, she joined 4H and spent time raising chickens, training dogs, riding horses (dressage and three day events) and growing vegetables. After two years at the fantastic Santa Rosa Junior College, she headed to UC Davis where she focused on Food and Wine, graduating with a B.S. in Food Science and a M.S. from the famous UC Davis Enology & Viticulture Department. After graduation, Janice joined Jordan Winery as their Enologist where she worked with their phenomenal winemaker Rob Davis and legendary wine consultant André Tchelistcheff. Janice spent 20 years as their senior Enologist where she learned from the master’s and helped craft the quintessential Cabernet sauvignon from Sonoma County.